COMPANY PROFILE Mangalore Refinery and Petrochemicals Ltd is engaged in refining oil and producing petroleum and petrochemicals. It operates a line of retail service outlets for the marketing and distribution of its petroleum products. Mangalore Refinery and Petrochemicals Ltd (MRPL) is a subsidiary of Oil and Natural Gas Corporation Limited that operates a refinery located in India. It processes crude oil from light to heavy with a level of automation. The refinery under MRPL includes distillation units, hydrocrackers, platforming units, and technology for hydrogen and bitumen, among others. Units at the MRPL facility can produce products to meet a range of regulations and markets. As a compliment to refinery operations, the company operates a line of retail service outlets for the marketing and distribution of its petroleum products. Marketing and distribution is also available for a host of other industries including mining, construction, power, agriculture, and others. 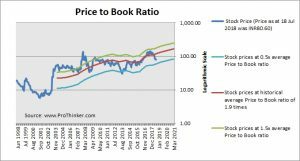 At the price of INR80.60 as at 18 Jul 2018, Mangalore Refinery And Petrochemicals Ltd is trading at a Price to Book Ratio of 1.3 times current book value. 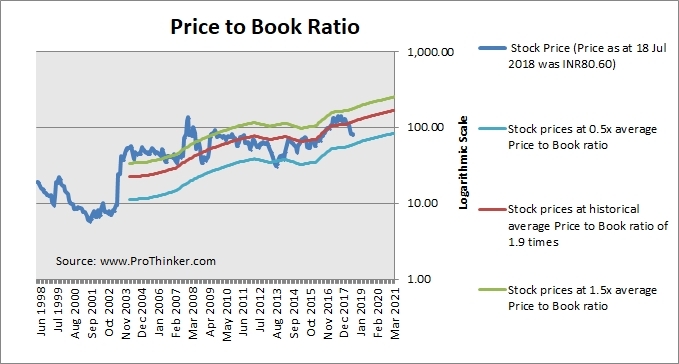 This is a 32% discount to its historical average Price to Book Ratio of 1.9 times.